Six years ago, when we were working on the January/February 2010 issue in mid-November, we would have been reviewing our options for the cover photo (above) from a set of images supplied by Editor at Large Clair Kofoed. This image of a Hartmann & Weiss round-bodied self-opener won us over and became an eye-catching symbol of all that a handcrafted fine gun can be. If you like shotguns, this photo can hold you mesmerized by the gun’s perfection—wherever your eyes fall. 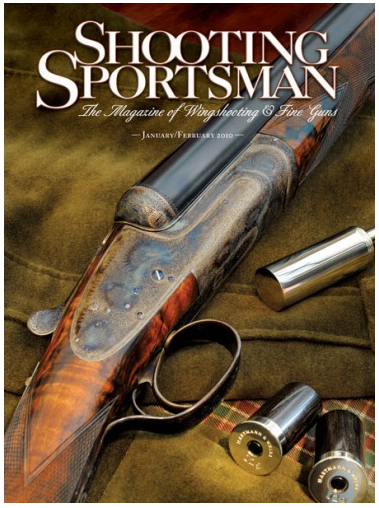 That same issue introduced readers—through Clair’s feature article—to the German “best”-gun maker, whose very limited output has included some of the world’s finest guns of recent decades. This was the firm’s first round-bodied self-opener of this design, built on a Boss-patent action that the originators themselves have built fewer than 60 examples of. Our cover gun is now coming up for auction—at Holt’s Auctioneers December 10 sale in London. The estimated sale price is between £40,000 and £60,000—about $60,500 to $90,750. (And don’t forget about the buyer’s premium and value-added tax on the buyer’s premium. This could add up to real money.) The online catalog features many more great photos. See the Holt’s Auctioneers catalog entry.